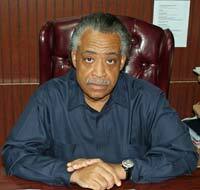 Al Sharpton is a popular American Baptist minister, television and radio talk show host and a civil rights activist. He was also a candidate for Democratic nomination for U.S. president in 2004. He makes regular guest appearances on Fox News, MSNBC and CNN. In the year 2011, Al was named host of MSNBC’s Politics Nation show. Al Sharpton was born in Brooklyn, New York. When he was 4, he preached his very first sermon and also toured with the gospel musician Mahalia Jackson. In 1963, his father left his mother. His mother was forced to take a job as maid, but the income was very low. Due to the extremely low income, the Al’s family qualified for welfare and they moved from their home to public housing projects in Brownsville, just next to Brooklyn. In 1972, he took a position as the youth director for a presidential campaign of Congresswoman Shirley Chisholm. In 1973, Al became the tour manager for James Brown. After graduating from high school, Al joined Brooklyn College but he dropped out after 2 years in 1975. Al founded the National Youth Movement in 1971. This was to raise some resources for the impoverished youth. On August 1984, Bernhard Goetz shot 4 African-American men in New York. At the trial, Goetz was actually cleared of all his charges except possession of dangerous weapon. Sharpton led marches to protest what he termed as a very weak prosecution of case. Together with other activists, Sharpton said Goetz’s actions were simply racist and even requested some civil rights investigation. On December 1986, three African American men were greatly assaulted at Howard Beach by a mob of white men. One week later, Sharpton led about 1,200 demonstrators to a march the streets of Howard Beach. Some residents around the beach screamed racial insults at the protestors, who were mostly black. On August,1989, four African American teenagers were assaulted by group of about Italian-American youths in the Bensonhurst, Brooklyn neighborhood. One 16 year old was killed. Following this assault and the murder, Al led marches through Bensonhurst. He also threatened that the three survivors would never cooperate with the prosecutor unless the prosecutor’s office hired more black attorneys. In 1991, Michael Riccardi attempted to kill Al Sharpton. Riccardi was later found guilty and sentenced. In the same year, Sharpton founded National Action Network. Al Sharpton continued with his civil rights activities and, in 1999, he and other activists protested against the police shooting of Tyisha Miller in California. The district attorney of the area stated that the police officers had erred in judgment but had committed no crime, declining to file charges against the offices. Sharpton led protests and he was later arrested for this. In 1971, while on tour with James Brown, Al met Kathy Jordan, a backup singer. Kathy and Al got married in 1980 but they separated in 2004. He later married Marsha Tinsley.